New teen drivers ages 16-17 years old are three times as likely as adults to be involved in a deadly crash, according to new research from the AAA Foundation for Traffic Safety. 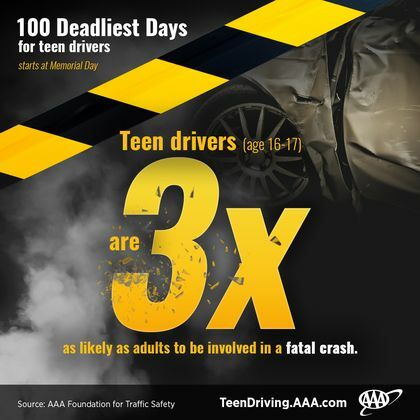 This alarming finding comes as the “100 Deadliest Days” begin, the period between Memorial Day and Labor Day when the average number of deadly teen driver crashes climbs 15 percent compared to the rest of the year. Over the past five years, more than 1,600 people were killed in crashes involving inexperienced teen drivers during this deadly period.